imagine, you are in Alaska or Iceland with your closest friends. It is midnight when you go outside to stare at the stars, hoping to find more. You are covered in layers of thermal and fleece, wearing mittens, puffy coats, winter hats, and scarves, wrapped in wool blankets, with a tall thermos of chocolate in your hands. The midnight sky dotted with stars suddenly is filled with swirling streaming colors of light. You enjoy the moment, and when it is over you tuck the memory away for safe keeping, that you might try to retrieve it again, like one often does with wonder-filled moments. 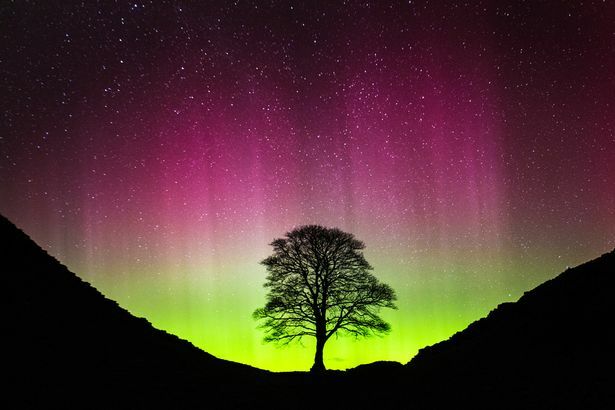 The Northern Lights begin with the sun, the wind and a magnetic force; to be more specific it involves solar wind and the earth's magnetic field. "The Aurora Borealis – otherwise known as the northern lights – is a vivid demonstration of the Earth's magnetic field interacting with charged particles from the sun." Experiencing the Northern Lights often means taking risk and having patience. Unlike the Great Barrier Reef, the Grand Canyon, and other natural wonders of the world, there is no guarantee that if you spend all your money on a tourist vacation you will get to witness the wonder of neon colors dancing in the sky. These lights are elusive and mostly unpredictable. The conditions must be JUST right to see an aurora. When I think of the different properties and causes of the Northern Lights I think of the Holy Spirit. I think of the way God's spirit moves. I think of how it is often compared to the wind, and it is solar wind that creates the auroras. I think of how sometimes we just want to capture and contain the beauty it creates, but God in all His beauty is uncontainable. I think of the magnetic field, and the forces that pull at our hearts. I think about the wonder of it all, and how we too are invited to be apart of it. Lord let your spirit move in our lives, that it may create a beautiful and lovely light. 5-6 Jesus said, “You’re not listening. Let me say it again. Unless a person submits to this original creation—the ‘wind-hovering-over-the-water’ creation, the invisible moving the visible, a baptism into a new life—it’s not possible to enter God’s kingdom. When you look at a baby, it’s just that: a body you can look at and touch. But the person who takes shape within is formed by something you can’t see and touch—the Spirit—and becomes a living spirit. This post is apart of a mini-series I am writing called An Invitation to Wonder about the 7 natural wonders of the world. Thanks for joining me.